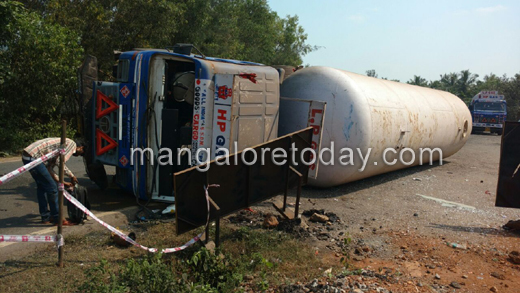 Kumta, Oct 28, 2016: LPG tanker topples on National Highway 66 near Betkuli in Kumta on October 27, Thursday. The accident occurred as the driver lost control on the vehicle. The LPG tanker belonged to Bharath Petroleum plying from Mangaluru on its way to Mumbai topples. The police personnel and the fire brigade team rushed to the spot immediately and conducted the necessary investigations, handled the incident. Kumta police are investigating the case.